formerly "The White Cube": Tax Time takes a long time. Plus, in answer to the avalanche of responses in re: the Greatest American Artist of the Twentieth (Thanks Gigi and Luanne! ), see below. Looking closely at the center bottom panel, of the prior strip, you can see Ad Reinhardt, hastily caricatured as promised, waiting in line for the Whitney Biennial. The Greatest American Artist of the Twentieth Century, I tell you. 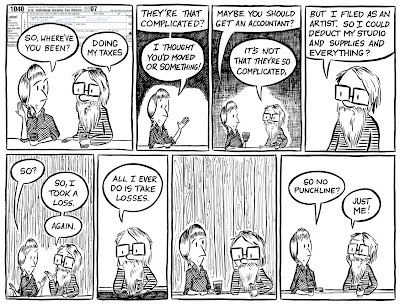 Also, for further Ad Reinhardt comics images (well worth the time), you can head here (special thanks to Silverstein Gallery for doing the good deed of showing these and keeping the images online).